Buy your Frozen on Broadway tickets before going to New York. Purchasing your theatre tickets online will save you time and money. Disney’s snow Queen Elsa, her sister Anna and their snowman friend; Olaf turn New York City into the Kingdom of Arendelle. They’ll take you and your children on a magical journey to their world of snow and ice.Frozen, the musical is based on the famous Disney movie of the same name and is the ninth Disney musical to be performed on Broadway at the Disney theatre. Book your tickets for Frozen before you travel, and enjoy mega hit ‘Let it Go’ with the entire family. You will be carried away by the enchanting story of Frozen: The movie of which has now been transformed into a magical musical. You’ll recognise little princess Elsa, who struggled to control her powers; to turn everything around her into snow and ice and her loyal sister, Anna. Elsa flees the restraints of the castle after she accidentally unleashes an eternal winter on the Kingdom with her strengthening and uncontrollable powers. Anna heads out to find her sister, on an adventurous journey full of obstacles. She gets unexpected help from snowman Olaf, the handsome Kristoff and his reindeer, Sven. How to buy Frozen on Broadway tickets? It is easy to buy tickets for Frozen via the below link. I recommend buying tickets online, before your trip to New York. Why? The below website guarantees the best seats; in the Orchestra or Front Mezzanine sections, at discounted prices. You will save time, money and most importantly won’t have to stress about shopping around for tickets when you’re in New York. A lot of Broadway musicals are very popular and often sell out. Seats are assigned by the theatre, which is why you won’t know your exact seating at the time of booking. Seat numbers will be clearly marked on the tickets. For bookings up to 4 people you are guaranteed seating next to one another. With larger groups, the theatre will try its best. Eric’s Tip: Because all the well-known songs from the animated movie have successfully made their way on to the Broadway version, you’ll have a hard time not wanting to sing along! 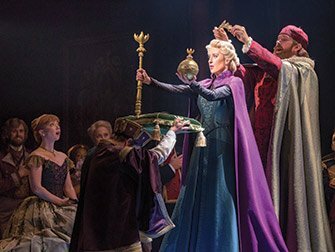 Frozen is a musical for families who want to experience the magical icy world of Arendelle.